Configure, secure, tune and speed up your system to the max! Windows XP, Windows Vista, Windows 7 and Windows 8 offer great opportunities to be customized. Unfortunately, most of these features are not available through the control panel and can only be configured by modifying the main Windows settings database which is called the Windows Registry. Since this procedure is only suggested for advanced users and should only be done with highest caution, 1-abc.net Settings Organizer offers many of these options in a small and easy to use program under a totally easy to use interface and with very understandable explanations to each single option so that even beginners can configure their system to let it behave the way they want. By changing settings with this program, the user is able to tweak and tune his system, to speed it up, to ease the work on it and to make it more secure. Additionally, Windows includes complete and well-featured configuration and analyzing tools like MS Config or the so-called Computer Management Tool, that are nearly ‘hidden’ normally, even if it would make sense to use them from time to time. 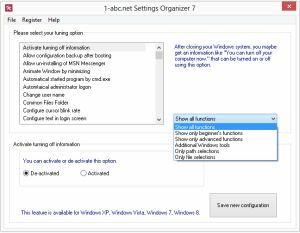 1-abc.net Settings Organizer allows you to execute these tools just with one click instead of researching the web for the right shell command to start it. And the best: 1-abc.net Settings Organizer saves all modified settings to backup files that make it easier to reverse changes if necessary. 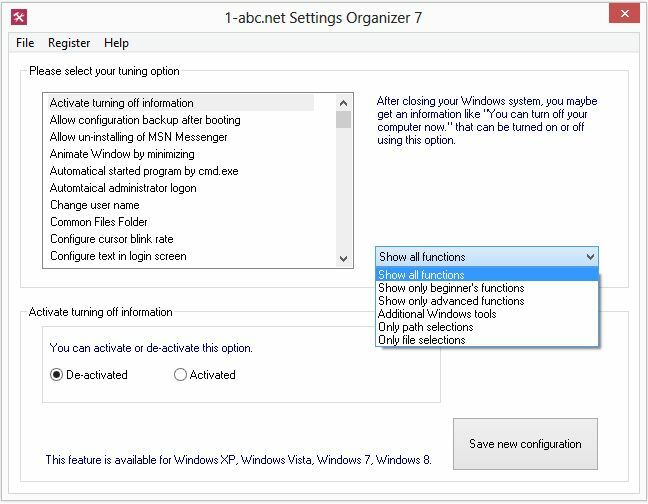 Accelerate your Windows interface, close security lacks and make working with Windows just as easy as you want it to be - 1-abc.net Settings Organizer is the mighty tool to do all these things!